All three services depart from the same pier in Koh Phi Phi (Ao Tonsai Pier). Departure times for ferry services from Koh Phi Phi to Klong Jilard Pier in Krabi. Tickets for all services from Koh Phi Phi to Krabi can be booked online by using the Search Box below. All services to Krabi depart from Ton Sai pier in the centre of Koh Phi Phi island. The main town of the island is located on Ton Sai beach. There is a boat service to Phuket from Koh Phi Phi’s northern pier at Laem Thong beach, but no service from Laem Thong beach to Krabi. Shared Taxi: You can catch a shared songthaew taxi (converted pick up truck) from Klong Jilard Pier direct to Ao Nang beach or into Krabi Town where you catch minivans, buses and songthaew to all points in Krabi and beyond. Private Taxi: The most expensive option. Private taxis at Klong Jilard Pier do not have fixed prices and they rarely use the meter. Agree a price before you travel with a taxi. Minivan: Public minivans do go direct from Klong Jilard Pier you need to go into Krabi town to catch a minivan. Departures to Ao Nang, Surat Thani and many other destinations leave from the roadside near to the Vogue Shopping Cente in the centre of Krabi Town. Krabi Town itself has an interesting morning market and some popular seafood stalls and restaurant by the river front in the evening. 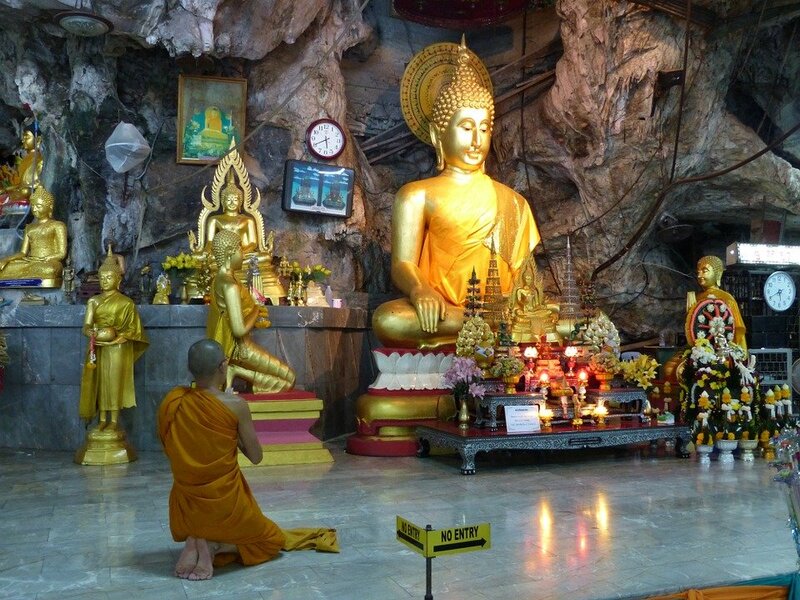 However, the most popular destinations in Krabi Province, such as the Tiger Cave Temple and Railay Beach, are located outside of Krabi Town and for this reason few foreign visitors opt to stay in Krabi Town itself except for a single night whilst on route to and from the nearby islands.